In ideal running conditions, I ran a 3:58:25 marathon at Cluj Napoca last month. More important than the timing was the fact that I finished strong and did not suffer anytime during the race. 1. If you thought race selection is important; Well, I had absolutely no idea I would be in some East European city in April. Hence I had no say in race selection. 2. If then, training is important – Well, after a forgettable Auroville marathon experience (guess why there is no race report yet? ), I have only been “Base Building”, running a max of 16k on my weekend long runs at Easy pace. 3. And of course, you have to be deep pink in health, right? Wrong again – I was recovering from a terrible cough and cold, as a result of some high pitch singing at my Brother-in-law’s wedding. Neither the 5-hour layover between flights at Munich nor the pathetic train journey from Timisoara to Cluj, helped the cold, sniff. 4. It must have been the mind then – a positive frame of mind, filled with optimism. Let’s not even get started on how miserable my business meetings were during run up to the race day. So, if you were looking for a short-cut to marathon success, you won’t find it here. 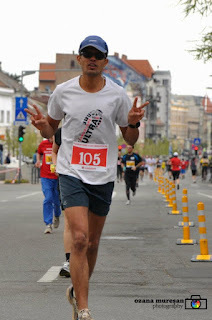 But despite all the circus, I find myself at the starting line of the Maratonul International Cluj 2012. I guess I would never be as proud for having made it to a marathon start line. For one, it was the first time I was able to participate in a marathon while on a business trip, a first race in a sparingly-English speaking country. 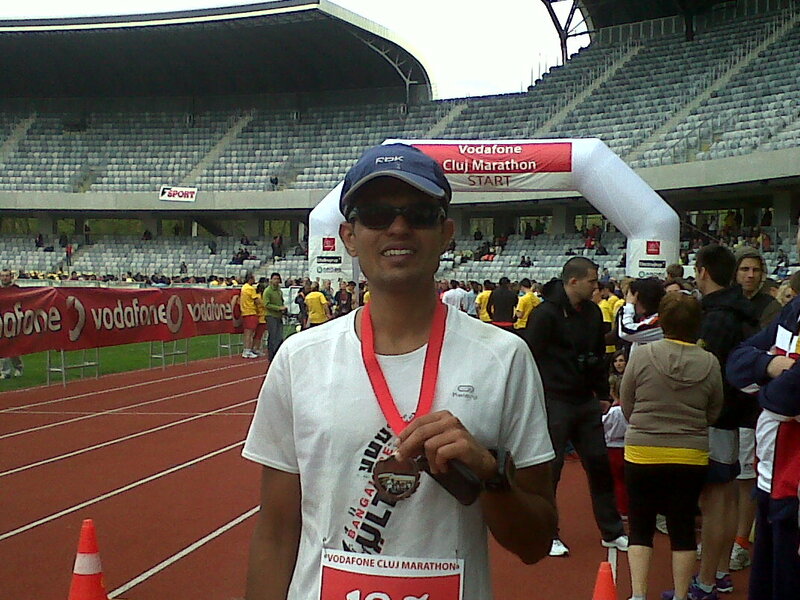 Arguably the first Indian to run the Cluj Marathon! I fantasized about the idea of participating in this one since March when a business trip was being planned and Google threw this one up. But fearing evil forces (read “client”), I kept this to myself. When the trip seemed more likely than not, I booked myself on an Inter-Regional train from Timisoara to Cluj. I will skip the gory details of the lousy train journey and fast forward straight to race report. Although I was at the Arena (a massive stadium opened in 2011) even before the organizers arrived, the registration was smooth. The race director did not speak English, but I got plenty of help from the University students. T-shirt, running bib and some fancy samples with Romanian instructions. I gorged down loads of vegetarian pasta and made some friends with the race volunteers (if you guys are reading this, please connect with me on FB). I spent the rest of the day walking around Cluj – down from the Arena along the Napoca street to the Union (Unirii) Square. A typical European square with Gothic styled buildings, a massive Cathedral and a statue of King Matthias Rex. Seated on a massive stallion, with his head held high reflected a certain arrogance and command over his soldiers around him. It was a treat sitting in one of those benches and just admiring the structure. There was plenty happening in the square to keep me occupied too. My 4 hour walk took me to Avram Square, the Opera – I was ticking off touristy places from a map I was carrying. Matthias Rex would inspire me every single time (of 8 times) that I passed it, the next day. The race started at a very civilized hour – 9:15am. Despite the cold and mild fever the previous week, I was relaxed at the start line. With the bigger challenge of “getting to start line” behind me, I was now looking forward to enjoy the run. The pacing strategy was crucial –I had planned to stay in sight of a sub-4 finish and keep a steady 5:30min/km pace. The course was a 5km and back (almost), repeated 4 times. It was refreshing because it went right through that tourist map, passing all the major squares (and some incessant honking by impatient traffic). It was a flat course, with water stops every 3kms and brilliant cool weather. I alternated between water and energy drink and held the pace around 5:30min/km till 30km, keeping the focus on the 5k lap time. All the 5k laps till the 30k mark were between 26m:30s to 27m:40s. The half marathon had come and gone in 1h:53m. After I had run into the stadium a third time, I knew I was entering the most crucial part of the race – the last 10k. In the past, at Auroville this year, I had taken 1h:20m for the last 10k and 1h:30m at Mumbai in 2011. There were niggles, I was slowing down a bit, but made that extra effort to keep pace. I only began working backwards from the finish time when I had run 3h:40m. I was running near the stadium, 39k in the bag, with a 1.5k and back to the stadium for the finish. The math was titillating – 3k @ 6min/k pace would get me to finish under 4-hour. I decided not to stop even for water, fortunately my calf gave me trouble only once and a mild massage was enough to carry me through. Shouts of “Bravo, Bravo” greeted me into the stadium as I made my way towards the finish line with the clock reading – 3h:58m:25s. The results put up on the results board, slotted me at Rank #55 in about 257 participants, a third sub-4 finish for me. I walked 2km to my hotel, where sleep did not come easy. The evening was spent walking ~5k of undulating trails in the botanical garden, before I caught the lousy train back. Only, on the return trip the train seemed less irksome, thanks to the Cluj Marathon Finishers Medal!